Multidisciplinary researchers at Concordia University are proving that, actually, you can teach an old medicine new tricks. A team of Concordia students and researchers from the Engineering and Biology departments are researching how gold nanoparticles could be used to carry drug treatments inside normal and cancerous-type human cells. The idea for the project was inspired by the desire to understand the effects of a traditional Indian Ayurvedic medicine known as Swarna Bhasma, a treatment mostly made of microscopic gold particles which are burned and granulated with plant extracts. A total of six students—three in biology and three in the engineering programs—took part in this multidisciplinary project. The idea came from research associate Simona Badilescu, a chemist working in Pakirisamy’s lab. Badilescu noted that this project is an excellent opportunity, as the education system seems to be behind the real working conditions outside of the classroom. The team recently published a paper in Science Reports, showing that both traditional and lab-engineered gold nanoparticles are able to enter human fibroblast and HeLa cancer cells without causing harm. Both human cells packaged and actively transported the gold particles inside their protective membranes, where they had no noticeable effect on cell activity at the individual or population level, explained Alisa Piekny, the co-director of the Concordia Centre for Microscopy. “If you wanted to explore the use of gold nanoparticles as a potential therapy, in terms of bringing the cancer drug into the cell, at least you know that they’re not going to hurt your healthy cell population,” Piekny explained. In some cases the gold particles were able to break out of the cell’s packaging, called a vesicle, and enter into the nucleus where DNA is stored. This ability means that the particles could be developed to carry therapeutic molecules directly to the site of action—no matter where that is within the cell, Piekny said. 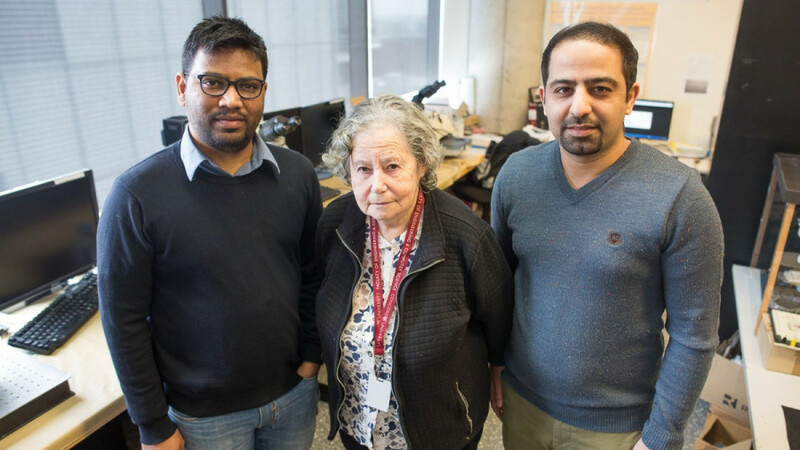 The nanoparticles for the study were engineered at Concordia to sizes smaller than 1/10,000th the thickness of a single human hair. From there, the engineering researchers refine the size, shape, and electric charge of the nanoparticle either to potentially attach therapeutics, or even change the way a cell functions. However, this research is still in the preliminary phases and more work is required to determine the ideal conditions. One exciting possibility for the biology researcher could be to engineer the nanoparticles to clump in a way that would allow the therapeutic compound to stay in the bloodstream longer than traditional medicine, or get caught in smaller blood vessels at the site of a tumour for a more targeted therapy approach. “Where I see the advantage of the carrier, is to help them get to the right spot so that its not globally disrupting everything,” she said. The ability of small gold particles to pass through cells has not been widely studied in the past, and could help foster a new understanding of how and why Swarma Bhasma appears to have therapeutic properties. 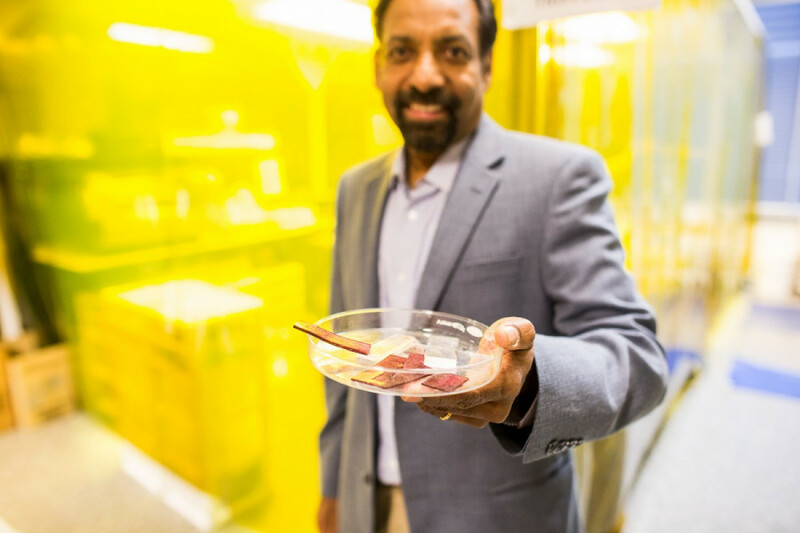 “Doctors [in India] have been using this, Swarna Bhasma, for various ailments […] cancer, arthritis, and even anti-aging sometimes,” said Concordia Institute of Aerospace Design and Innovation researcher, Muthukumaran Pakirisamy, who started the project. “I asked the doctors if they know how it works, and they don’t know, but they know it works. They know the expected dosage, but still the science behind it is not that clear. So my curiosity is to find the science behind it, and that’s why we started this work,” said Pakirisamy. “I travelled in India several times, and I learned a lot about Ayurveda and what it means, the history, and so I was very happy to convince Dr. Packirisamy to go ahead with this project, and he got more and more involved and interested. Now we are completing more of this project from different points of view and to see what we will get. At the same time, the students are involved, and they do part of their PhD project, so they will be very interesting projects with elements from so many fields,” Badilescu said. Because of the way modern education focuses students on a specific field, many students graduate without having a basic understanding of the concepts or even the way research operates in other fields, Badilescu explained. Packirisamy agreed, noting that learning a multidisciplinary approach helps the students branch out, and better prepares them for the working world. “Any multidisciplinary studies are very challenging. My students are mostly engineers, they don’t know what a cell is. They know a cell phone but not a cell,” he joked. In a separate interview, Piekny noted how the two teams with differing approaches ended up complementing each other. “I see the engineers, the entrepreneurs, the designers, they’re always thinking of the next new innovative way to do something, but [biologists] are thinking always in the scientific method. We have a question, sit at the hypothesis, then we design our experiment, and our experiment has to have controls to know that we’re actually supporting or refuting our hypothesis,” Piekny said. The next step in the research will be to determine if the gold particles that enter into the nucleus have the ability to change the DNA within the cell, and also to make refinements to the process. Packirisamy said, with the promising results coming from the lab, a new therapy based on gold nanoparticles could be developed within five to 10 years.